Many years ago I started a band with a guy I was dating at the time. 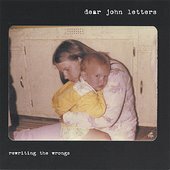 The band was called Dear John Letters. Basically he would write songs and I would write the lyrics. At first it was just for fun, eventually it evolved into an actual band, we even got a few great reviews and sold a couple records. I still get letters from people, mostly women, all these years later. They tell me stories about how they found Rewriting the Wrongs and listened to certain songs over and over again while going through bad breakups. They thank me for writing words that really summed up or tapped into how they feel. The irony to me is the one song that comes up the most is the one song I didn't write about a relationship. This song is probably the one thing that I ever had a part of that was dripping with hate and disdain. I can't say I have ever felt this sort of hatred for anyone I have ever cared about and to think that people out there do feel that way surprises me a little. Today I received another email from a woman who told me that after her marriage broke up she listened to this song called The Other Shoe over and over again and it helped her somehow. I am happy that something written from such a dark place is doing positive things. I personally can't listen to this song without getting upset. I wrote the song in question about child abuse and how little the legal system really does to punish abusers. It was written from the perspective of anyone who has ever been hurt by these people. Anyone who has ever felt like justice was not served and who has considered taking things into their own hands to get justice only to feel powerless and helpless knowing the law actually protects these people who harm children. It was born from a place of hope that the old saying "What goes around comes around." really holds some truth. That's how it goes. Once you write something, it belongs to the readers, not to you. You can say you never intended for it to be about a relationship, but for those who feel that it is, well, it just is. Your blog is a joy.